All our available apps for Android devices. All editions supports both mobile phones and tablets. Famous in WP (1,5 Million happy users, 4.3/5.0 rate),now for Android! 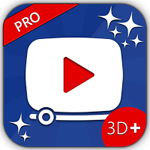 - Play your HD videos with realtime 3D media effects. - 3D videos require 3D anaglyph glasses to watch. - All media effects are produced on the fly, during playback without any pre-conversion. The paid version of the myVideos 3D+ application. Full, without any advertisement, for Ever! Get it from the Google Play Store.. Preview a showcase video of the powerful myVideos 3D+ for Android in action!